Swapping crop insurance for ad hoc or supplementary crop disaster assistance has dramatically increased the cost taxpayers shoulder and transformed legitimate assistance for periodic disasters into an often generous form of annual income support. Adding salt to the wound, crop insurance actually exacerbates rather than reduces the environmental consequences of disaster payments. In February 2015, the Government Accountability Office investigated whether crop insurance premiums cover the cost of losses on high-risk land. Their findings were stunning. In aggregate, farmers were actually making money by buying crop insurance policies because payouts regularly exceeded farmer paid premiums. Worse yet, for farmers in high-risk areas, every dollar of crop insurance premiums brought an average of $1.97 in net gains. Meanwhile, farmers in low-risk counties made a profit of 87 cents for every dollar paid for premiums. Crop insurance ensures farmers can still make money even when they plant on risky and environmentally sensitive land. Moreover, crop insurance payouts were even larger in high- risk states and counties than were disaster payments. Farmers in Texas, North Dakota, South Dakota, Kansas and Florida received 48 percent of all ad hoc disaster payments and SURE program payments between 1995 and 2012. Crop insurance costs were just as concentrated – these five states made up 42 percent of total net crop insurance costs. In fact, premium subsidies alone were larger than disaster payments in all 5 states. Administrative and operating expenses were almost as high as disaster payments in North Dakota, South Dakota and Kansas (Figure 3). Total ad hoc and SURE disaster payments to these five states were $8.9 billion, while crop insurance costs were three times as large at $27.2 billion and premium subsidies were twice as large at $19.7 billion. 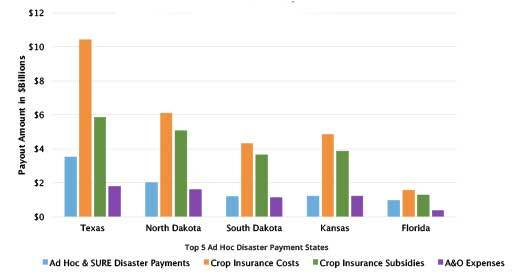 Figure 3: Crop insurance costs were much larger than disaster payments in the five main ad hoc disaster payment states. The concentration of disaster payments, crop insurance costs and crop insurance payouts was even more striking for the 35 counties that got the most ad hoc disaster and SURE payments. From 1995 through 2012 these 35 counties made up 15 percent of ad hoc disaster and SURE payments, 11 percent of total crop insurance costs and 10 percent of total crop insurance payouts. Disaster payments to the top 35 counties were $2.7 billion while crop insurance costs were $7 billion and crop insurance payouts were $8.6 billion. Over those 18 years, only in 2005 were net crop insurance costs for the top 35 counties smaller than ad hoc disaster and SURE payments. In 2013, EWG’s “Going, Going, Gone!” report found that between 2008 and 2012 at least 2,500 wetland acres were converted to cropland in 13 of the top 35 disaster payment counties. Thirteen counties (some the same as for wetland conversion and some different) out of the top 35 had at least 2,500 acres of highly erodible land converted to cropland. Disaster payments and crop insurance payouts both encouraged farmers to increase the number of high-risk and marginal acres they farmed. In the 1970s, the disaster payment program largely consisted of payments for low crop yields and prevented planning. These provisions paid farmers if drought or irrigation problems kept them from planting their crops or resulted in low crop yields. Prevented planting payments were made through the disaster payment program from 1973 through 1981, and were much lower than payments for low crop yields. In the 1974 disaster program, for example, prevented planting payments totaled $35 million while low-yield payments were $522 million. The Federal Crop Insurance Act of 1980 essentially moved the prevented planting provision from the disaster payment program to the crop insurance program. In the years following the 1980 act, farmers were not entitled to a prevented planting disaster payment if they were eligible for crop insurance. Farmers could only receive a prevented planting payment through ad hoc disaster assistance if the secretary of Agriculture deemed it necessary, or if they were not eligible for crop insurance. In 2008, when major ad hoc disaster legislation stopped and the replacement disaster programs for livestock were set up, prevented planting payments were made exclusively through crop insurance. Currently, the only prevented planting payments that are made through a disaster program are those made through the noninsured crop disaster assistance program to farmers who are not eligible for crop insurance. In April 2015, EWG released an analysis of the costs of the prevented planting program between 2000 and 2013. We found that prevented planting payments during this time amounted to $8 billion nationwide. Most of these payments were concentrated in the Prairie Pothole region of North and South Dakota. The 195 counties in this region received $4.9 billion in prevented planting payments from 2000 through 2013. Switching from disaster payments to crop insurance clearly did not solve the prevented planting “problem” that critics associated with disaster payments. Worse yet, prevented planting payments under the crop insurance program are so large and so frequent they encourage farmers to plow out seasonal wetlands in what is considered the most important remaining wetland complex in North America. Another important criticism of disaster payments in the 1970s and 80s was that they encouraged farmers to behave in ways that resulted in adverse selection and moral hazard. Adverse selection is when a farmer who is buying crop insurance has more information than the seller of the insurance. For example, a farmer may know that one of his fields is risky when used for growing corn, but the federal crop insurance program does not account for the greater riskiness and sets premiums at the same price as for other, less-risky farmers. Moral hazard is when a farmer engages in riskier behavior after receiving crop insurance. For example, a farmer may use a different cropping pattern, such as growing corn on corn, after receiving insurance because he would be insured if he received lower yields.